Here's an interesting oddity I turned up while looking for some stuff in my old studio yesterday. It's a pinup drawing from back in 1986 that I drew and Michael Dooney inked. Well, she's reminiscent if Wendy Pini's ElfQuest characters but I don't think any of her elves had cloven hooves. That's not very helpful, is it? I don't know what character this is, but the pin up is cute as a button! Does Dooney remember? 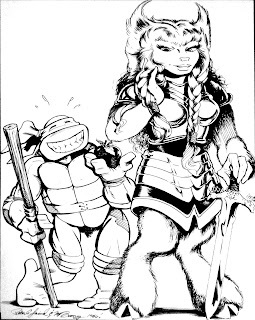 Other then The turtles(obviously) and Usagi Yojimbo, are there any other comics featuring anthropomorphic characters that you are a fan of? Is this maybe from one of the Palladium TMNT role playing games source books? She looks like a Mutant Bison to me. -->> ..yeh we were married for five years ..
..until some Bo carryin' reptile started gettin' cheeky. Like mah mama done told me; ya gotta watch out for the quiet ones. I have been trying to find the original artwork for this piece for YEARS! Who do I need to contact about purchasing the original for this piece of artwork? I have alot of history with The Aniverse and it's co-creator Randy Zimmerman. The Aniverse was the very first black and white independent comic book I ever bought and it was in this issue of The Aniverse #1 by WeeBee comics that this piece appeared as the inside back cover. The character he is with is Varcel the leader of Varcel's Vixens a band of bounty hunting characters from The Aniverse. I ended up working for Randy and later went on to work with Caliber Press and then on to inking for DC Comics, Marvel Comics and many other companies. I always treasure this issue of The Aniverse as it played a big part in my early years as an aspiring comic book artist. It will thrill me to no end to be able to own this original artwork. If you own this piece, could you PLEASE contact me? My email is inkmachine@gmail.com. I would contact you personally, but I cant seem to find an actual e-mail address on this page. Thanks so much! I really really hope I get to hear from you!